Roster last updated on April 17, 2019. 2502 04-1993 916218 916218-2 Unit currently stored, but still on the active roster. 2506 05-1993 916218 916218-6 Unit is stored at Progress Rail at Mayfield, KY for strip-down for SD70ACC rebuilding. 2508 11-1993 936432 936432-2 Unit is stored at Progress Rail at Mayfield, KY for strip-down for SD70ACC rebuilding. 2511 11-1993 936432 936432-5 Unit currently stored, but still on the active roster. 2512 11-1993 936432 936432-6 Unit is stored at Progress Rail at Mayfield, KY for strip-down for SD70ACC rebuilding. 2513 11-1993 936432 936432-7 Unit is stored at Progress Rail at Mayfield, KY for strip-down for SD70ACC rebuilding. 2516 11-1993 936432 936432-10 Unit currently stored, but still on the active roster. 2518 11-1993 936432 936432-12 Unit is stored at Progress Rail at Mayfield, KY for strip-down for SD70ACC rebuilding. 2519 11-1993 936432 936432-13 Unit currently stored, but still on the active roster. 2520 11-1993 936432 936432-14 Unit currently stored, but still on the active roster. 2523 11-1993 936432 936432-17 Unit currently stored, but still on the active roster. 2526 12-1993 936432 936432-20 Unit is stored at Progress Rail at Mayfield, KY for strip-down for SD70ACC rebuilding. 2527 12-1993 936432 936432-21 Unit is stored at Progress Rail at Mayfield, KY for strip-down for SD70ACC rebuilding. 2529 12-1993 936432 936432-23 Unit currently stored, but still on the active roster. 2535 09-1994 936433 936433-4 Unit currently stored, but still on the active roster. 2536 09-1994 936433 936433-5 Unit is stored at Progress Rail at Mayfield, KY for strip-down for SD70ACC rebuilding. 2539 09-1994 936433 936433-8 Unit is stored at Progress Rail at Mayfield, KY for strip-down for SD70ACC rebuilding. 2540 09-1994 936433 936433-9 Unit currently stored, but still on the active roster. 2543 09-1994 936433 936433-12 Unit is stored at Progress Rail at Mayfield, KY for strip-down for SD70ACC rebuilding. 2545 09-1994 936433 936433-14 Unit is stored at Progress Rail at Mayfield, KY for strip-down for SD70ACC rebuilding. 2547 09-1994 936433 936433-16 Unit is stored at Progress Rail at Mayfield, KY for strip-down for SD70ACC rebuilding. 2549 09-1994 936433 936433-18 Unit currently stored, but still on the active roster. 2550 09-1994 936433 936433-19 Unit currently stored, but still on the active roster. 2551 09-1994 936433 936433-20 Unit is stored at Progress Rail at Mayfield, KY for strip-down for SD70ACC rebuilding. 2552 09-1994 936433 936433-21 Unit currently stored, but still on the active roster. 2553 09-1994 936433 936433-22 Unit is stored at Progress Rail at Mayfield, KY for strip-down for SD70ACC rebuilding. 2554 09-1994 936433 936433-23 Unit is stored at Progress Rail at Mayfield, KY for strip-down for SD70ACC rebuilding. 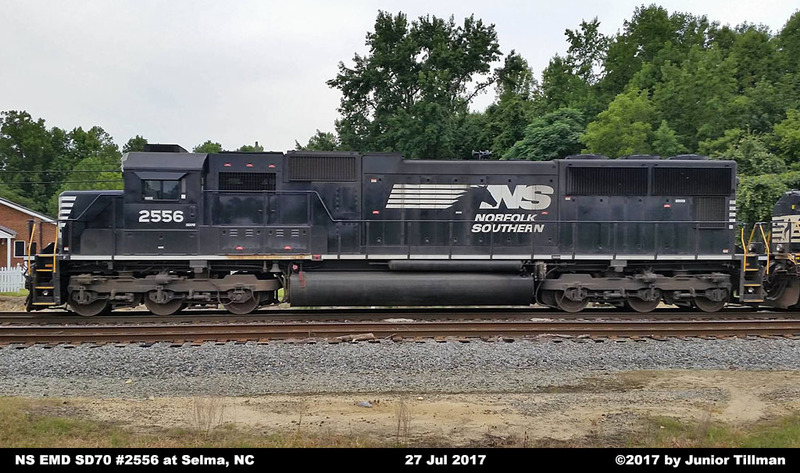 2555 09-1994 936433 936433-24 Unit is stored at Progress Rail at Mayfield, KY for strip-down for SD70ACC rebuilding. 2556 09-1994 936433 936433-25 Unit currently stored, but still on the active roster. All units have been equipped with cab air conditioning.